Copyright © 2006, Oregon Kayaking. No part of this page may be reproduced, linked, or copied without the express written permission of Jeff Bowman the Oregon Kayaking webmaster. 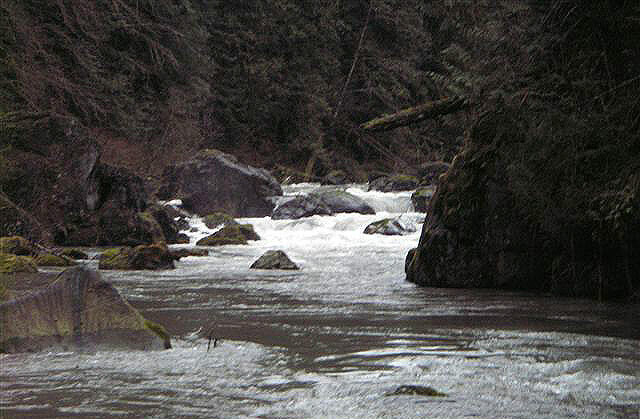 Washington’s Sultan River is a beautiful, 13 mile, class IV which hovers on that fine line between an easy creek run or a tough playboat run. 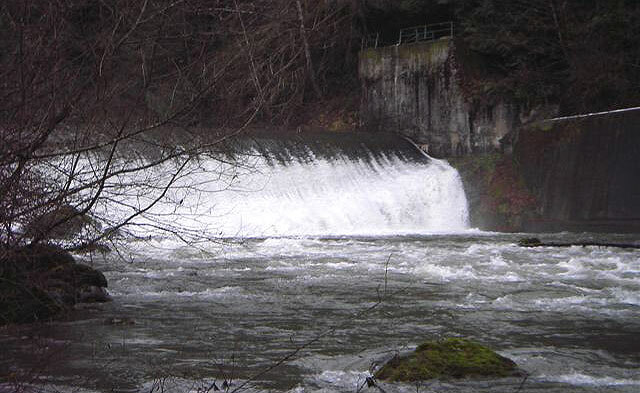 The Sultan lies dormant below Culmback Dam except during times of severe flooding. 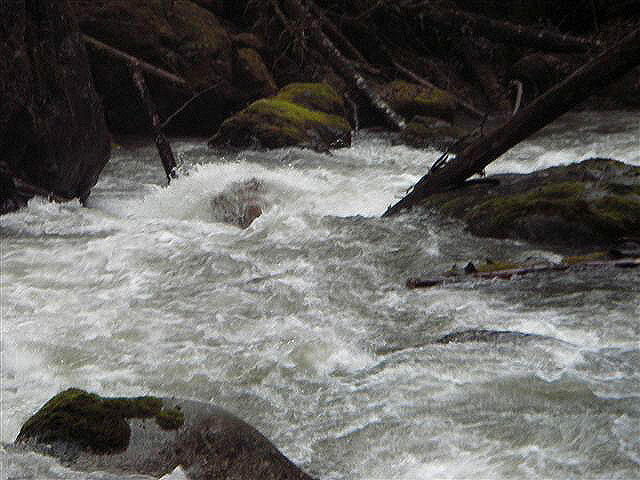 During a high water event in the fall of 2004, a landslide famously separated two groups paddling the river and forced them to hike out. Since the landslide there was much speculation as to the condition of the run, but the dry winter of 2005 prevented anyone from investigating. Enter the Snohomish County PUD, who announced that they were planning an unprecedented release to test some new equipment. The word went out and soon several groups of boaters were eagerly awaiting the first day of the release. We had a group of six paddlers for this trip. Rob, an accomplished paddler and local legend, Eric who had done the trip the previous year (early enough in the day to complete the long run before the landslide), Mike and myself made up the Seattle area delegation. Joining us from Leavenworth were Al and John. Along for the ride was Mike’s fiancé who graciously agreed to take the day off work, wake up at 3:30am, and drive shuttle for us. The icy predawn of December 15 saw a strange collection of individuals gathering at the Sultan Bakery, frightening the regulars. The parking lot was full of cars with kayaks and paddlers were coming out of the woodwork. Seeing a traffic jam in the works, we made a hasty exit. Dropping cars at the Trout Farm takeout (takeout for the lower Sultan Run), we packed all 7 into one not-so-large Tacoma and headed for the put in. The road was well plowed all the way to Olney Pass. On reaching the Pass we found PUD tallying boaters and handing out waivers. By their count we were group number 3 for the morning, paddlers 9-15. On reaching the second gate, where the FS road leading to the put in splits from the PUD access road we unloaded. The FS road is passable by four wheel drive for about 200 meters before it is blocked by downed trees. The trees are small and a motivated party with a chain saw could cut them out easily. This would get your vehicle to the road landslide spot (not to be confused with the river landslide). The landslide is a bit of an ordeal to say the least, but doable. Soon after crossing the debris field we found the trail leading off to the right, well packed and even flagged by those passing before. Now begins the fun part. The descent into the canyon is class IV approaching class V at times. There were some near misses with boats, paddles, and other out of control pieces of gear. Expect to work you way around a lot of deadfall. Just keep heading downhill and you’ll find the river. If you're worried about hitting the right spot, the Lat/Long is ( N 47.9713' and W 121.7005' WGS84 ). All in all I think it took one hour 45 minutes to reach the put in from our vehicle. We caught both groups ahead of us at the put in, but it was relatively easy to space out. Now begins what we call "Dancing with Wood". The first bigger drop you come to has a significant piece of wood in the right channel. Go left or paddle very hard to clear it. Most of the wood on the run you can see from your boat, but not this little guy. 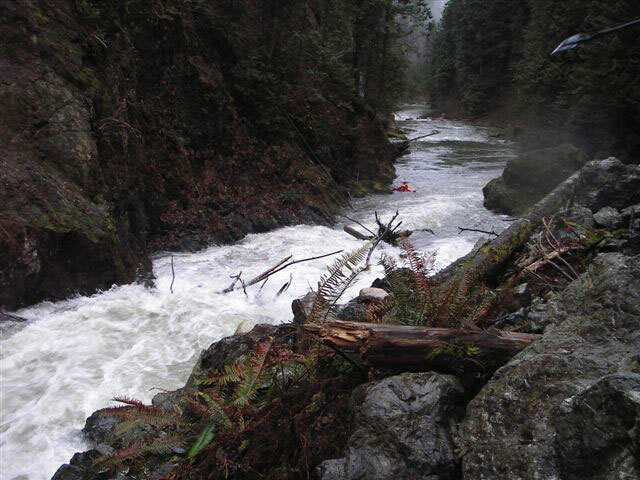 Picture of the drop is below, wood is in the river right channel. One of the paddlers did not approach this wood with enough speed to clear it and went for a swim. Everything from here to the diversion dam can be boat scouted. At the flows we saw it was a bit bony, so expect to hit some rocks if you roll (I rang my bell HARD on the ledge following the drop pictured above). Almost all the drops have wood blocking at least some lines, so proceed with caution. A typical drop in this section is pictured below. One of the features of this section was an incredible looking playhole. I don't remember the exact location, perhaps half way to the diversion dam. It had eddy service on both sides and nice deep ramp. If anyone else has a better fix on the location (i.e. coordinates), please let me know! Shortly above the diversion dam midway through the run we had another tangle with wood when Al’s boat (minus Al) broached hard against a strainer. A little rope work and she popped free. Things proceed on about this level until the diversion dam. PUD was at the diversion structure keeping an eye on things. We were polite, they were polite, everyone was happy. Al didn't feel on his game, was cold from a couple of swims and opted out at this point. PUD offered him a lift to the takeout which he accepted. Diversion structure is pictured below. The road which leads to the diversion structure has two gates according to PUD. However it does offer a walk-out option midway through the run. We followed the well defined trail around the dam. Although it looks and probably is runnable, PUD asked us to stay off of it. 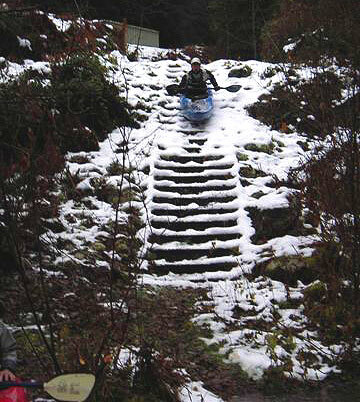 You can however, slide down the stairs at the end of the portage. 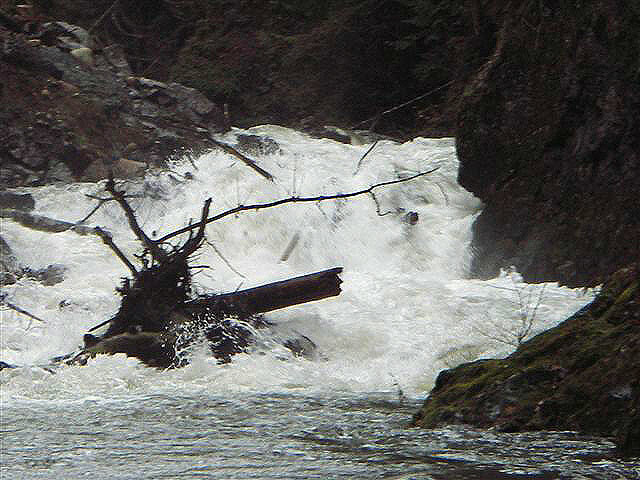 The section following the diversion dam contains several portages due to wood, and a few rapids that are bigger then the upper section. 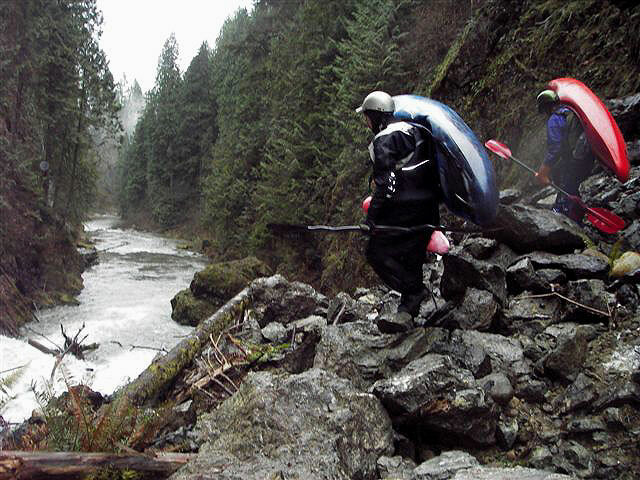 The first portage came soon after leaving the structure, the obstruction can be seen from your boat at the top of the drop. As always on this run, we portaged right. Although there appears to be lines around this obstruction, closer inspection suggests that it would be dicey to the point of stupid. Downstream from this we came across a rather benign log lying across the river that forced us out of our boats again. Plenty of slick rocks and lots of muttering. There are some good drops in this section, almost every one of which had wood in at least one spot. Proceeding cautiously we eventually reached the infamous landslide. Oh, what a beautiful drop it would be if it wasn't completely chocked with wood. You could probably charge the first pile right in the middle, break through the small branches and rail slide the center log down before fighting to the left around the last pile. One quick note of caution… the debris field and the remaining slope are highly unstable. I thought a tree was going to fall on me while portaging. Keep your helmet on and eyes open. After this, things tapered off until Last Nasty, a ledge with a tricky approach and a good hydraulic which marks the start of the lower run. There was still plenty of troublesome wood to keep us from getting too relaxed. When we hit Horseshoe Bend (you'll know you're there) we knew we were on the home stretch. Reach the powerhouse we picked our line over the lowhead and continued to Last Nasty and the lower run. Last Nasty was in good form, and I almost have all the water out of my sinuses. Our group (now numbering five) continued through the lower run to the Trout Farm takeout. PUD was at the takeout (along with our sixth) with hot chocolate and boater surveys. All in all, it was a fine day on the river. Should releases become a regular thing in the future the put in trail will need some attention and some other small details will need to be attended to. Additional information on the run and associated logistics can be found on the Upper Sultan page on the American Whitewater website. The challenges to running the upper Sultan are considerable, mainly as a result of somewhat complicated logistics. One must be willing to take advantage of a winter rainstorm on a moment’s notice (likely at 11 PM the night before and usually on a weekday), to get expedition gear ready and shuttle set before it’s even light the next morning, to be prepared to hike your boat in at least two miles and possibly longer depending on the snow situation at Olney Pass, and to be willing to negotiate Last Nasty (most likely as dusk approaches) with what may be too much water. Despite these barriers, the upper Sultan River is still enjoyed by a few groups every year, and for those who do make it to the water they can celebrate being on one of the regions finest whitewater runs. With clear and dependable access and improved flows this run would undergo a transition from an exploratory adventure to a true northwest classic. Note: The current license for the Sultan River hydropower project is set to expire in 2011. 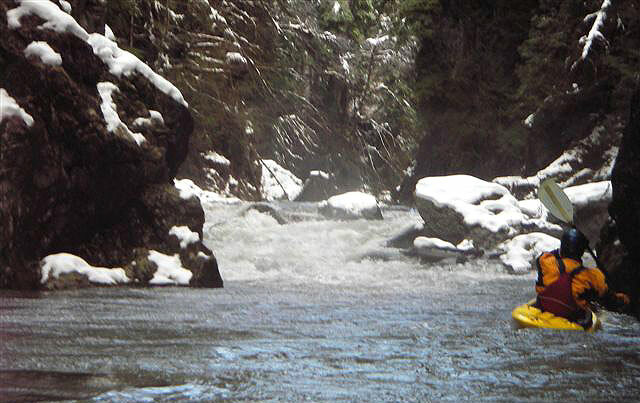 American Whitewater has already begun working with the local paddling community and other members of the Hydropower Reform Coalition with the combined goals of improving access (gate closures related to perceived security threats have been an ongoing issue), development of flow management that effectively balances recreation with other project needs, and transfer of information between the utility and the general public. If you would like to be more involved please contact local StreamKeeper Andy Bridge <andy@wernerpaddles.com> or WA Regional Coordinator Tom O’Keefe <okeefe@riversandcreeks.com>. Meetings with the utility to discuss relicensing have begun and the public is invited to participate. 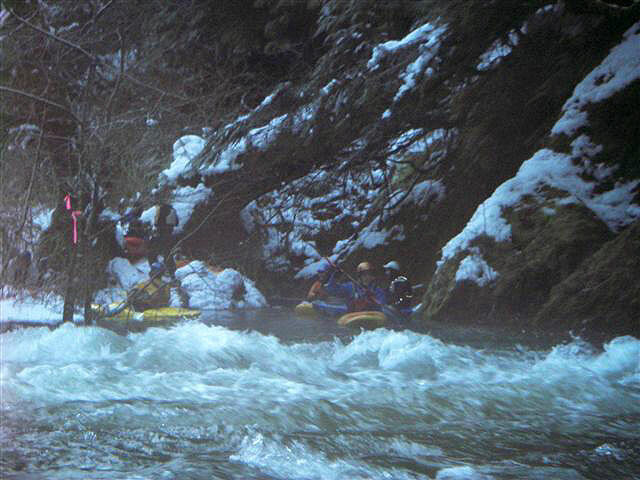 Future updates and information on how you can become involved will be posted on the American Whitewater website.